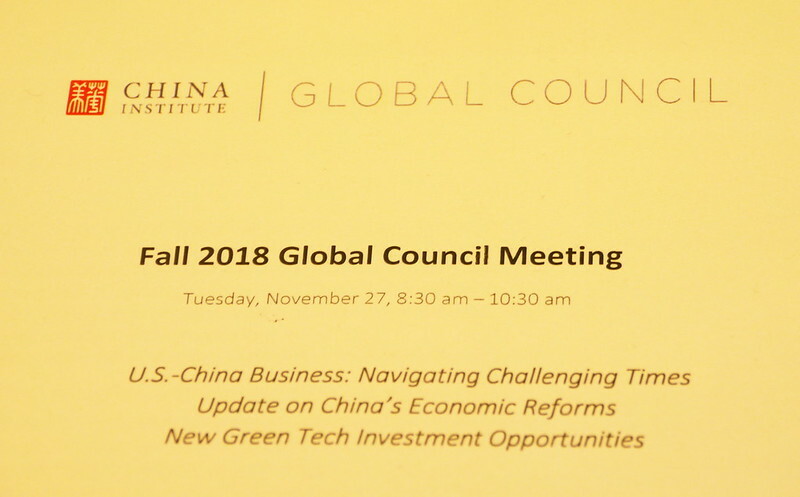 China Institute’s Global Council takes place twice a year as invitation-only forums among C-suite executives that explore timely issues impacting businesses in the U.S. and China. Held in both New York and China, these closed-door meetings offer high-level insights, convening thought leaders to discuss challenges and opportunities in the U.S.-China business relationship. In the midst of escalating conflicts and tensions between China and U.S., China Institute’s latest Global Business Council featured candid and insightful conversations between Hank Greenberg and Yue-Sai Kan on U.S.-China Business: Navigating Troubled Times, data-driven analysis and talk on China’s economic reform by Nicholas Consonery of Rhodium Group, and a riveting briefing of China’s green tech investment opportunities with Barbara Finamore of NRDC. China Institute gratefully acknowledges EY for its support of the Fall 2018 Global Council Meeting. Nick Consonery’s recommendations: What could China do to get the US-China relationship (and its own economy) back on track? 3) Remove technology transfer requirements.